Zen Studios has been rocking out some fantastic pinball tables lately, particularly in their line based on Marvel Comics. And the train keeps a'rolling with the announcement of Marvel Pinball: Avengers Chronicles, a batch of three new tables based around some of the biggest adventures of "Earth's mightiest heroes," and one on a tale yet to be borne out, based on the upcoming film, The Avengers. I'm less interested in that last one, with it's 3D models based on real-world pretty boys and girls, but it does sound like it's going to be neat. "Marvel's The Avengers" will feature balls with special abilities representative of the individual characters in the group. 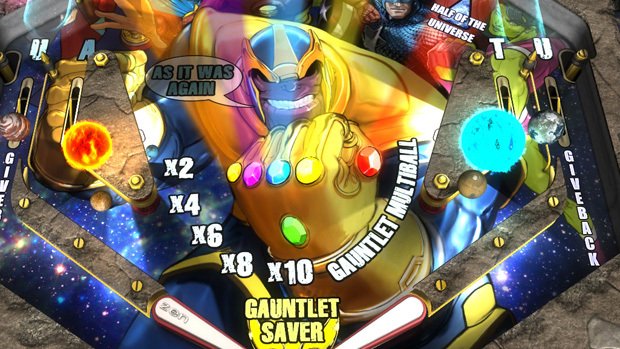 "The Infinity Gauntlet," on the other end, has table-wide effects based on the individual gemstones found in the Gauntlet, including a gravity reversal mechanic I am highly eager to check out. The other two tables are "Fear Itself," a battle against Odin's lost brother which Zen promises will have some never-before-seen uses of magnetism in a pinball game, and "World War Hulk," a recounting of that time Hulk was shot into space and came back to Earth in a really foul mood. All four tables in Marvel Pinball: Avengers Chronicles will be coming this spring as DLC to Pinball FX2 on Xbox 360 and Marvel Pinball on PlayStation 3, as well as in a standalone product for PS Vita. In the meantime, check out a batch of screenshots from "The Infinity Gauntlet," "Fear Itself," and "World War Hulk" in our gallery.